I am not trying to "protect" anyone but do you realise the amount of work (and cost) that goes into keeping beads, seeing that orders are done exactly and properly wrapped and dispatched? I am an ardent beader and just my stocks, neatly kept, are enough to drive me insane so I hate to think how the bead sellers cope with all the beads, findings, accessories, etc around them. 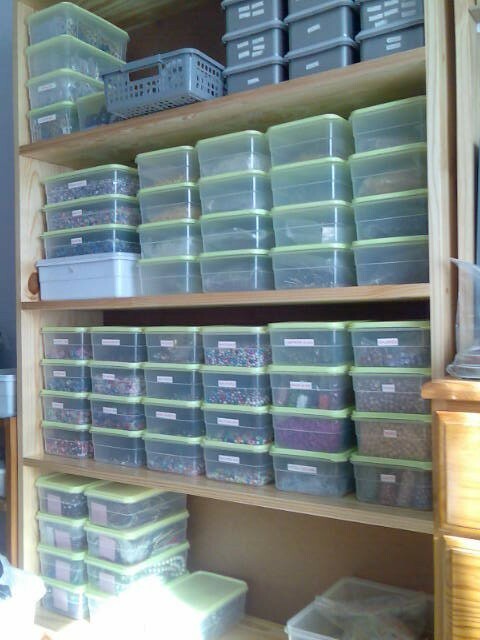 In reply to Lily's post - the below pic is of my OLD office - when I had only ONE bookshelf of tubs (all beads). I now have THREE bookshelves FULL of tubs - two in the office and one in the diningroom, accompanied by one long old "sideboard" from my grandfather's garage - two large areas with shelves, and the left hand side is 10 drawers! Plus one chest of drawers dedicated just for ziplock plastic bags, one chest just for "gifts" for my customers and organza bags, and another cupboard just for incense, etc. And yes, I'm still "overflowing" as most of the stock I have is NOT online yet! Lol, I am referring in particular to this person"
as far as I can see there is one sale of an Alfa Romeo - what does this have to do with crafts? And how does a listing, such as this end up being a top 10 seller on the craft category? Someone elses name should be up there, no not me, but someone who has actually made the sales in the appropriate category. Aah, ok now I see- it was for the overlocker, darn is the craft section doing so badly? Weird. Very weird. And it's a classified nogal?! Why on earth can BoB / MacMuffin not put a dual listing in place? Is this beyond the limits/capacity of the BoB machinery? Surely a little simple code in the right places could list the top ten in each category? Yes, I agree that we need a list of sellers who sell the most items as well. I feel that many sellers that were on the top ten list and are no longer will feel very unhappy about this. This change basically tells everybody that you must sell high-priced items to be considered a top seller. and what about the fact that many sellers that sell lower priced items are offering bargains and therefore are favourites amongst buyers? Surely, these sellers should also get some recognition? As a bead seller myself, I may sell literally hundreds (if not thousands) of beads per month / sales period, but as these are generally low priced, at this rate I'll NEVER be on the top seller's list! I have currently 1046 items in the craft category alone, but this means absolutely nothing if you're not "advertised" as a top seller! Perhaps Mac can make a plan for us.. I treat every buyer the same, no matter how much they've spent, & I work just as hard on every sale.. Chances are I'll never make it high on the list with the current system as I don't sell consoles & higher priced gadgets. And see my reply too - I think perhaps what I suggested is the best solution for everyone! Ooopppss. That is not good advertising for BoB. Was lazy and decided not to open my eyes..
Roars of applause for sellers of beads and other accompanying stuff!!!! I don't know how you do it, or keep track of it all, and keep it in order, but I've never had a bad experience with these wonderful people, on bob. Well done, and thank you!! !